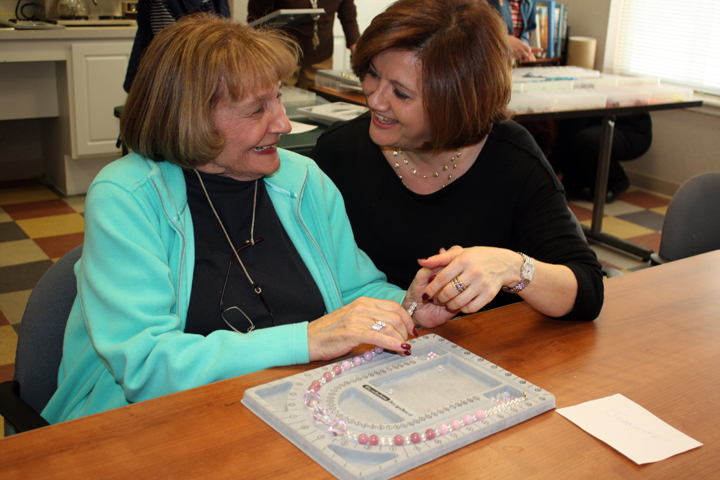 2014 Women to Work Award Recipient Myriam Cohen chats with a Meer resident during a jewelry-making class. When her 24-year marriage ended, Cohen worried about how she and her two sons would manage. Her sudden divorce left the stay-at-home mom feeling worthless and unprepared to enter the workforce. Cohen had a college degree in early childhood education, but she hadn’t worked outside the home in nearly 20 years. Plus, she yearned for more than just a job with a paycheck, she wanted to discover her life’s calling. A friend recommended the JVS Women to Work Program, which launched Cohen on a path to self-discovery. During the eight-week program, she completed career interest and work skills assessments, learned how to write a resume and cover letter, practiced interviewing and took computer classes. Cohen flourished in the program and learned that she indeed possessed valuable skills. Under the guidance of Judy Richmond, Women to Work coordinator, Cohen looked for a volunteer opportunity to build upon her strong people and organizational skills and to gain work experience. With newfound confidence and hope, Myriam became a volunteer at a senior living apartment complex and discovered that she loved working with the elderly. Her experience led to part-time work as an assistant to the program coordinator at the Fleischman Residence / Blumberg Plaza on the Jewish Community Center campus in West Bloomfield. Cohen is now employed full time at Meer Apartments, also on the Jewish Community Center campus. As activities director, Cohen plans and implements three to four activities daily for the community of nearly 200 residents. JVS honored Cohen at Trade Secrets on March 12 at Knollwood Country Club. The annual fundraising event raises money to support the JVS Women to Work Program, which helps women enter or re-enter the workforce after life-changing events, such as divorce or spousal death, disability or unemployment. The 10-week program helps women assess vocational interests, identify work-related skills, prepare resumes, develop interviewing and networking skills, and launch a job search. The next session of Women to Work Program begins with an informational meeting from 9-11 a.m. April 24, 2014 at JVS, 29699 Southfield Rd., Southfield. For information or to register, contact Judy Richmond at jrichmond@jvsdet.org or (248) 233-4232, or visit www.jvshumanservices.org/women.